You have been lingering, listening to our podcasts, reading our newsletters, and wondering when to invest in the CDs. NOW is the time. These are our lowest prices EVER. Begin the New Year with Calm. If you need help, please text us at 703-508-7907 or email Casey@CelebrateCalm.com. Buy Physical Copies of Everything We Have For $275.00 + FREE SHIPPING & DOWNLOADS -- SHIPS NOW! Buy Physical Copies of Everything We Have For 2 Payments of $137.50 + FREE SHIPPING & INSTANT DOWNLOADS -- SHIPS NOW! You get 12 programs, 25 hours, over 150 strategies, for less than $10 per hour. And this will change your family. 2. 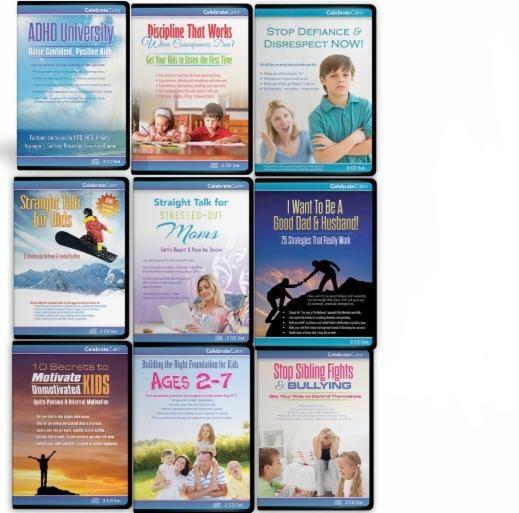 Stop Power Struggles with Strong-Willed Children. 3. Discipline That Works: Get Kids to Listen the First Time. 4. Stop Defiance, Meltdowns & Disrespect. 5. Casey’s Straight Talk for Kids. 6. 10 Secrets to Motivate Your Kids. 7. Straight Talk for Stressed-Out Moms. 8. Men: I Want to Be A Good Dad/Husband. 10. 30 Days to Calm. 11. Stop Sibling Fights (MP3 ONLY). Stop power struggles over phones, video games, and tablets without arguments or tears. Motivate kids to relieve stress, interact socially, get outside, and build confidence without screens. Set appropriate limits for kids ages 2-22. Know what to do when schools require an iPad, but this distracts your child.